"Mornings are made for coffee and contemplation." You can't argue with that, and you don't mess around with Jim. Wise words, though. I love the mornings where Sandy and I have a chance to share a cup of coffee together before embarking on the crushing madness of the day. Keeps us centered as a couple, I think. It's good stuff. And sometimes you need a good bite to go along with it. 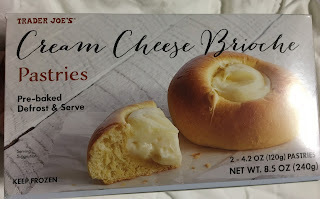 For $2.99, why not try Trader Joe's Cream Cheese Brioche Pastries for an at-home treat? These breakfasty buns have easy written all over them. As the box states, they're prebaked but come frozen, so there's two prep options. First is to bake on low heat in the oven until warm (but not toasty! ), the second is to let sit at room temp for a spell to warm up. Since there's two pastries....we tried both ways! There was a demonstrable better quality to the oven prep method. The box states 325 degrees for 12 to 15 minutes, but I pulled them out a little earlier. Perfect. The outside bread shell got just the right amount of toasty and gave way to a warm, softly sweet and doughy inside. Almost total carby comfort, topped off with a rich sweet cream cheese custard type deal on top. Think of the normal cheese danish type filling, and that's pretty close...and there's a lot of it, too. Yum. If going for defrost at room temp, maybe give it a little longer than the box calls for. We started consuming at about the instructed 45 to 60 minutes, and while everything still tasted about the same, there was a still a cool clamminess to most of the bun. That definitely had a damper on the overall appeal. Regardless, these make a nice breakfast treat. My only real complaint is that they're a bit big. I mean, instead of two mega-buns, four smaller ones might have done the trick better, especially with the serving size being half a big bready brioche. Other than that, worth a shot for sure, and better than Eggos for breakfast. I really enjoyed these- a home run in in my book! Definitely enjoyed the warmed in the oven method. The tender bread reminds me of kolaches. If you are a fan of the Polish and/or Texan pastry, you will really like these! They are probably like 1/4 lb (similar to the size of a normal doughnut). I expected them to be super sugary too and they are not at all. Why does TJs keep doing this with serving sizes? The prepared salad boxes often list 2 or 2.5 servings per container (2.5?? Seriously?) or my favorite which was when they listed one sandwich as 2 servings.... makes me crazy. Did you really have a half bun as a serving?